Welcome to my GMO-Free Information page! 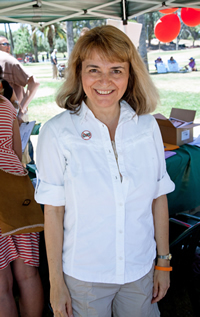 I enjoy spreading the word about how to avoid unnatural genetically modified foods in the diet in many different ways. Please check out the following ways my information may be helpful to you. For a definitive guide to understanding genetically modified (GM) foods, the food issue of our time, the compelling reasons for the fast-growing non-GMO movement, and exactly how to avoid GM foods, check out my new book Going Against GMOs. To avoid genetically modified foods, try the Eat GMO-Free Challenge that I created. It provides a tip a day for a month to gradually take GMOs out of your diet. If you’re interested in having me speak on the health dangers of GMOs and how to shop and eat out non-GMO, visit my Speaking page for additional information and send a request to me at speaking@melissadianesmith.com. 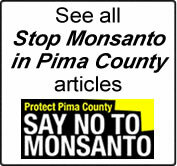 If you'd like to see my collection of Stop Monsanto in Pima County articles, visit this page. If you arrived here from the former GMO Free Project of Tucson and GMO Free Tucson websites and would like to receive notices of GMO-free and other nutrition education events that I do in the Tucson area, please check the box when filling out the form below with your name and email address. If you don't live in Tucson and want to receive the newsletter without receiving notices about Tucson events, please fill out the form without checking the box. After confirming your subscription, you will be signed up for my Against the Grain Nutrition News & Notes e-newsletter, which is sent out every few months (as my schedule allows) and usually contains timely GMO-free news. To search my blog for posts and articles I have done about genetically modified foods, visit my Against the Grain Nutrition News & Notes blog. Other sites of good information about GMOs include the Institute for Responsible Technology, the Organic Consumers Association, Food Democracy Now!, GM Watch, and The Organic & Non-GMO Report. To learn some basics about GMOs, read my 2012 article, “GMO Reality Check;” or read the speech I gave before the Tucson March Against Monsanto in May 2013; or watch this GMO-related news clip that ran on KVOA Channel 4 – and check out the Non-GMO Information section on my Resources page. Download my Find the GM Foods Word Game. Feel free to copy and distribute it for education purposes. If you are looking for places to eat out non-GMO in Tucson, your best bets are the Tucson restaurants that have been educated about how to make non-GMO meals: The Tasteful Kitchen, Pasco Kitchen & Lounge, Harvest, and Harvest on River are restaurants that have. Ask to speak to the owner or manager of the restaurant who is typically much more knowledgeable about the subject than most servers. Other places where you can get a non-GMO meal include Athens on 4th Avenue, Renee's Organic Oven, Tucson Tamale Co., and eateries where you can order bunless local grass-fed burgers (in lettuce wraps), such as Diablo Burger and Graze. For personalized one-on-one nutrition counseling sessions or more intensive coaching programs with me to help you avoid genetically modified foods or to nutritionally address health conditions you have, check out my Nutrition Consultation & Coaching page. Thanks for stopping by, and Happy GMO-Free Eating!